We are so excited about this. 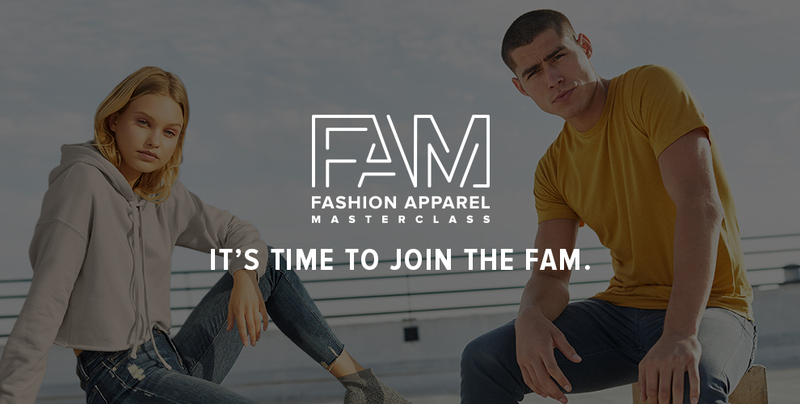 A year-in-the-making, we finally can announce the launch of FAM, the Fashion Apparel Masterclass. It’s a first-of-its-kind online educational program geared towards the promotional products industry. FAM provides modern solutions for the challenges the industry is facing today. You will learn SO much. Everyone from industry vets to brand-new players will take away knowledge from FAM that they can apply directly to their selling strategy. We teach you how to sell on value, not just price and incorporate storytelling, social media and decoration ideas into your pitch. There’s no question that the tools you learn in FAM will help you increase your margins and grow your sales. FAM is your chance to gain a competitive edge. Challenge yourself to become a Fashion Apparel Master and you’ll come to see the promotional apparel industry through a whole new lens. At BELLA+CANVAS, we recognized the hunger for knowledge and more robust education in our industry. At all the industry events we attended, people were talking about the same core issues affecting the promotional products industry. Increased commoditization, channel disruption and evolving purchasing habits have created an industry shift towards higher quality garments. As the pioneers of the premium apparel category, we see where the industry is headed and are in a position to provide tools and education for sellers who don’t want to be left behind. We felt a strong pull to create a program that would organize the industry in a new way, and we ultimately decided to make FAM completely free, allowing as many people as possible to benefit from the knowledge shared. See why we created FAM. Fashion Apparel Masterclass from BELLA+CANVAS on Vimeo. We are currently accepting applications for FAM. Signing up is free, easy and open to anyone in the promotional products industry. If this doesn’t apply to you, don’t worry! FAM will eventually roll out to other industries, outside of promotional products.